Trust is essential for us which is why our movers stick to the plan as well as the schedule and are there for you every step of the way to your new home. We provide so much more than just a team of movers and a truck: we provide a convenient all-around service that includes (dis)assembling of furniture, packing, and disposal. You can lean back and relax while our trained experts arrange the safe door to door transport of everything you want in your new apartment or house. SacherUmzug makes itself conspicuous by expertise in all types of moves, including clean-outs. 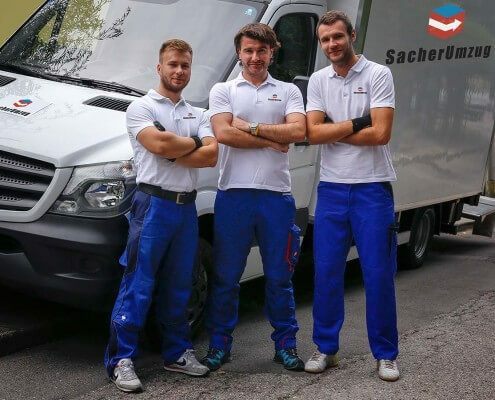 The experts at SacherUmzug offer an initial meeting free of charge to advise and estimate your moving costs. Whether it is local or long-distance, SacherUmzug will transport your belongings in safest and most efficient manner. Our employees are reliable and recognized as top experts in relocating and transportation. No time to pack your belongings? We can do that for you. SacherUmzug packing experts will perform this either shortly before your move date or on the day of your move.